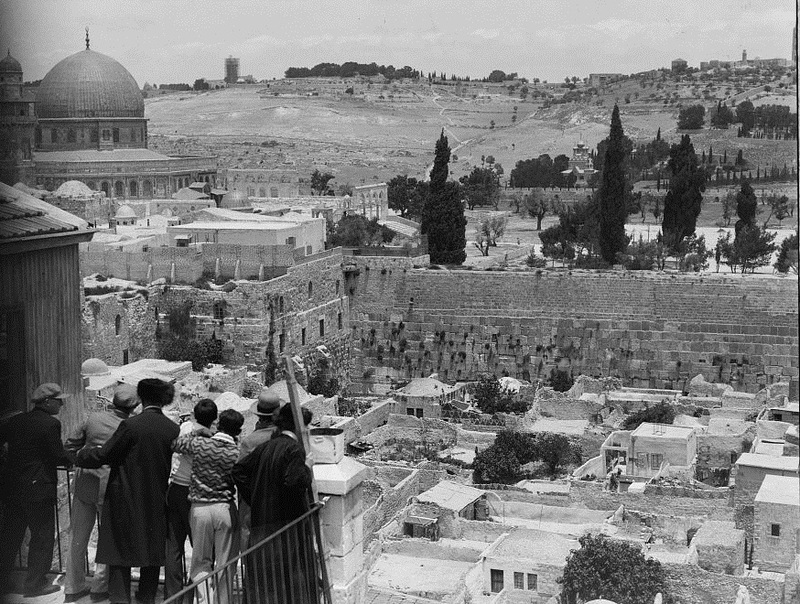 The ninth day of the Hebrew month of Av -- Tisha B'Av -- is the day in the Hebrew calendar when great calamities befell the Jewish people, including the destruction of both Temples in Jerusalem, the fall of the fortress Beitar in the Jewish rebellion against Rome in 136 CE, and the expulsion of Jews from Spain in 1492. The day is commemorated with fasting, prayers and the reading of Lamentations. 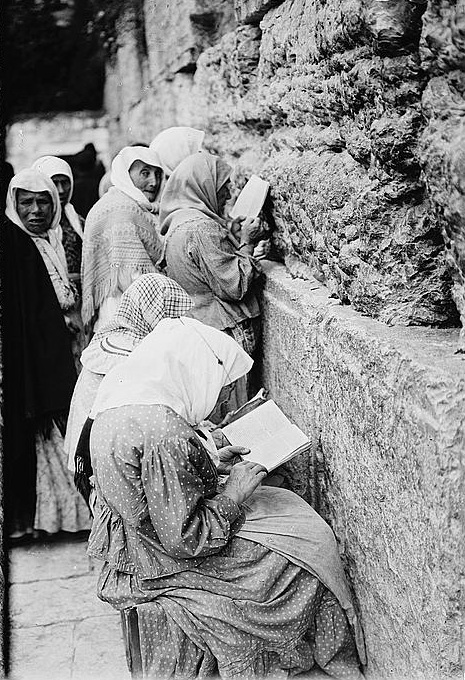 In Jerusalem, thousands pray at the Kotel, the Western Wall. or care-givers to the Jewish women. 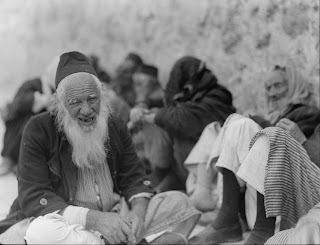 The American Colony photographers frequently focused their cameras on the worshipers at the "Wailing Place of the Jews." 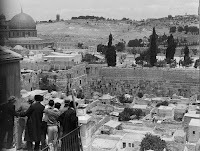 The Colony founders who came to Jerusalem in 1881 were devout Christians who saw the return of the Jews to the Holy Land as a sign of messianic times. Of the dozens of pictures at the Kotel there are several of elderly men and women sitting on the ground or on low stools, customs of mourning practiced on Tisha B'Av. "A Jewish beggar reading at the Wailing Wall" (circa 1920). 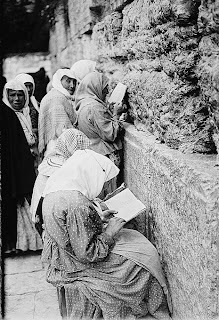 "Jews' wailing place without mourners. 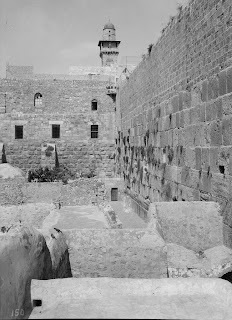 Other pictures presented here show the very narrow and confined area of the Kotel over the ages until Israel's army captured the Old City in 1967 and enlarged the Kotel plaza. The tragedies that occured to the Jewish nation are also evident in the pictures of the deserted plaza after Arab pogroms in 1929. 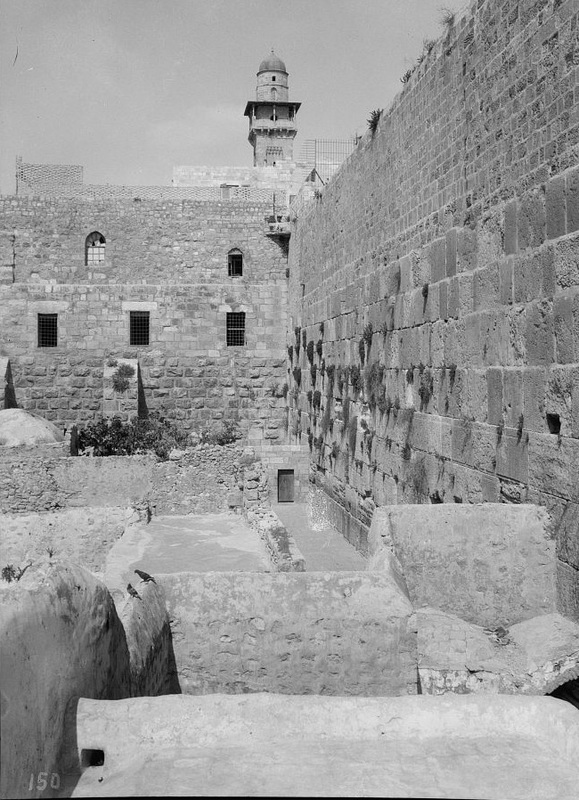 The area was deserted, of course, during the 19 years of Jordanian rule of the Old City when Jews were forbidden to pray at the site. A story is told of Napoleon passing a synagogue and hearing congregants inside mourning. 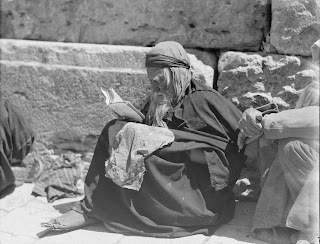 To his question who they are mourning, he was told they were weeping over the destruction of the Jewish Temple 1,800 years earlier. Napoleon responded, according to the legend, "If the Jews are still crying after so many hundreds of years, then I am certain the Temple will one day be rebuilt."